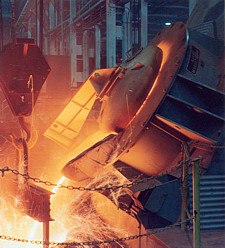 Ajax Tocco manufactures two types of induction melting furnaces for iron: Channel furnaces for melting and holding and coreless furnaces for batch type foundry operations. 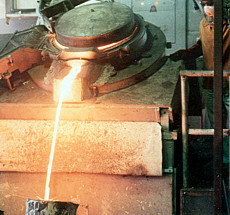 Flexibility to produce gray and ductile iron castings on short notice was the goal of this foundry. They converted a static converter to a 375 KW solid state system to power a 1500 pound furnace, then added a 600 KW, 300 Hz Pacer along with 3000 pound and 1500 pound steel case coreless furnaces. Strong and sturdy, this 25 ton coreless furnace features Ajax TOCCO's heavy walled hollow bar power coil and has seen extensive service in the production of mill roll iron.